Foundation used to be just a way of covering up the skin to improve its appearance and possibly also hide fine lines, wrinkles or blemishes. Today, however, skin foundations can serve a much more beneficial role. Unlike what you used to get in the past, foundation can now actually be good for your skin by protecting it from pollution, the sun and helping to balance oily or dry skin. As a result, foundations will now not only make you look good, but they can also offer some serious anti-aging benefits as well! In this article, we are going to be taking a look at some of the main anti-aging benefits that can be achieved by applying skin foundation to your face. Later, we will also look at what foundation can and can’t do and how to apply it correctly. You may be surprised at what you are about to discover! Normal day-to-day living exposes you to a wide variety of pollutants, and because your face and hands are the most exposed regions of the body, they will be the most affected by that pollution and so require the greatest amount of protection as a result. Pollution can come in many different forms. 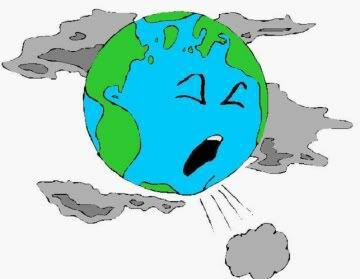 Some pollutants, for example, will be composed of visible particulates such as dust, dirt and soot, whilst other pollutants will be smaller and not visible to the naked eye. Pollution…it’s something you can’t get away from. In general, a person is likely to be exposed to a greater amount of pollutants if they live in a built up urban area where there are industrial factories and lots of cars. Those living in less populated areas, such as in the suburbs or countryside, will be less exposed pollution, but this is not always the case as prevailing winds can still carry significant amounts of pollution from nearby cities. 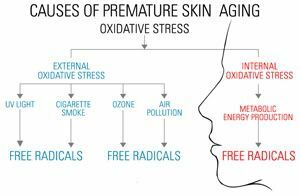 In terms of the health of your skin, invisible pollutants, those which you can’t see, tend to do the most harm as they can result in excessive free radical damage which causes premature aging. The first signs of free radical damage will often appear as irritation or inflammation of the skin, which can then progress to surface irregularities, fine lines and wrinkles which will cause you to look visibly older. 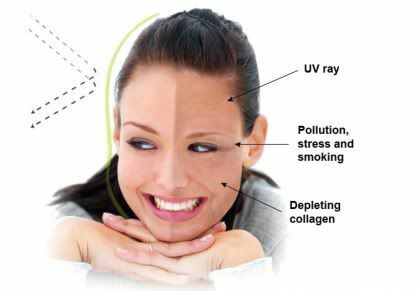 As a result, if you want to maintain a youthful and healthy looking appearance for as long as possible, it is absolutely essential that you take proactive steps to minimize the damage that the pollutants which you are exposed to can do to your skin. Unfortunately, applying a daily moisturizer, cream or lotion to your face and hands won’t stop pollution coming into direct contact with your skin. So what you really need is something that forms a barrier over your skin, something that will give it that extra bit of protection. Ideally, you should then be able to wash off this barrier at night so that you can get rid of the pollutants which you have collected throughout the day. The good news, is that there’s already a very easy and inexpensive way to do this, it’s called foundation. Foundation forms a protective barrier over your skin that shields you from pollutants and the sun. Of course, foundation won’t protect you from all external pollutants, and neither will it protect you from internal pollutants that occur as a result of an unhealthy lifestyle, such as drinking excessive amounts of alcohol, smoking and eating unhealthy foods. But it can still be a very useful cosmetic to add to your everyday anti-aging skincare routine, especially considering the fact that it can help you to look better too! Whilst getting some amount of sun exposure certainly can be very beneficial for your overall level of health, such as by boosting vitamin D levels, overexposure to ultraviolet, or UV light, can result in premature aging of the skin. Too much sunlight, for example, can result in hyperpigmentation (dark/brown spots), sagging skin (as a result of a loss of collagen and elastin), fine lines and wrinkles, all things that will make you look old! Many factors contribute towards the facial aging process. Fortunately, many foundations now come with a sunscreen in the form of a sunblock. This creates a protective barrier over the surface of the skin, which then reflects the rays of the sun rather than allowing them to penetrate into the skin where they could damage it. Most sunblocks will contain either zinc oxide or titanium oxide, both of which protect against UVA and UVB rays. From a health perspective, sunblocks tend to be a better option for protecting against sun damage, as there is some concern that chemical sunscreens may actually increase one’s risk of developing skin cancer due to the chemical reactions which occur when chemical sunscreens are exposed to sunlight. You may, however, still want to use an additional sunscreen alongside your foundation when you will be outside for long periods in strong sunlight to provide your skin with the maximum amount of protection. Even though you’re wearing foundation, it’s still a good idea to use sunscreen when outdoors for long periods. But if you do decide to do this, just remember that applying sunscreen from multiple sources does not result in a cumulative effect. So for example, if your foundation has a sun protection factor (SPF) of 15, and you are also using a sunscreen with a SPF of 15, then they won’t add up to SPF 30 by using both. At a minimum, you should be aiming for a SPF of 15, as anything less that this should only be considered for very light sun exposure such as during the evening. Most of the foundations that you will find in stores today are designed to complement your regular skincare products and your skin type. Different types of foundations can be used to reduce oily skin or rehydrate dry skin. Medicated foundations are also available for acne skin. For example, if you have oily or acne skin, you can buy oil free foundations so that your face won’t become overly oily by using them. If you have very oily skin, you can even get oil absorbing foundations that will act like a sponge and soak up excess oil that appears throughout the day. For people with dry or sensitive skin, there are foundations that can help to prevent moisture loss and also foundations that contain emollients and humectants which add moisture to the skin. Both of these can help to keep your skin hydrated so that it doesn’t dry out and wrinkle prematurely. If you are unsure as to what would work best for you, try talking to the sales rep behind the counter as they will probably have a good idea as to what will work best for you. Should You Use Foundation Every Day? Considering the anti-aging benefits that foundation provides, in addition to the enhancement it provides to your looks, wearing foundation daily is something that you might want to seriously consider. Whilst using foundation certainly can help to benefit the health of your skin, its use is entirely optional. 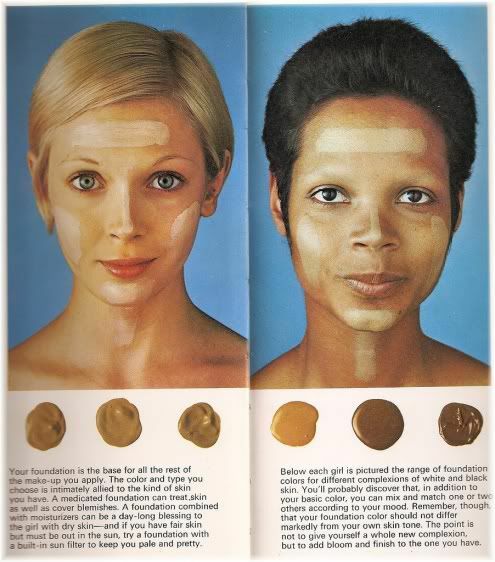 Some people, for example, don’t like the idea of using foundation as they prefer to let their natural skin tone show. It is still possible to maintain healthy skin without foundation, but unless you have a specific objection about it, then you may seriously want to consider using it on a daily basis especially now that you know the numerous anti-aging benefits it can provide you with. Although skin foundation is an incredibly useful skincare product, there are certain things which it can’t do. Being aware of these limitations is important as it will help to prevent misuse, such as applying too much or having a foundation line, and avoid disappointment from having unrealistic expectations. It’s obvious when you’re wearing too much makeup, and most men don’t find it attractive either. Foundation is not designed to conceal major flaws in your skin. If you try to use it for this purpose, you are likely to apply too much and it will appear as though you are wearing a mask. Foundations should compliment and enhance the appearance of your skin, but do so in a way that looks natural and doesn’t obviously change your normal look. Although foundation can be use to conceal minor pigmentation problems, it’s not designed to cover very dark patches of skin. Foundations can help to give your skin a more uniform color and also brighten your complexion. So if you have areas of hyper-pigmentation such as brown spots, or areas of depigmentation such as skin which is whiter than normal, the use of foundation as a makeup can help to lessen their appearance. However, if you have very dark skin pigmentation such as a birthmark or mole, then foundation won’t be very effective at hiding it. Rather, it would be better to use a camouflage makeup or concealer that matches your skin tone. Minor irregularities can be filled in to leave your face feeling smooth and soft. One of the biggest advantages of using foundations, is that they can quite effectively fill in any irregularities which you have in your skin. This will result in a smooth polished surface which makes your facial skin look much more youthful and attractive. Wearing foundation can help to lessen the appearance of blemishes, but it won’t make them go away completely. 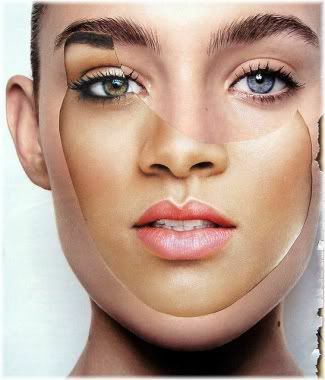 Whilst it is true that foundations can lessen the appearance of skin blemishes, they are not designed to conceal them. So if you have serious blemishes on your face, such as acne blemishes, you should use a concealer instead. 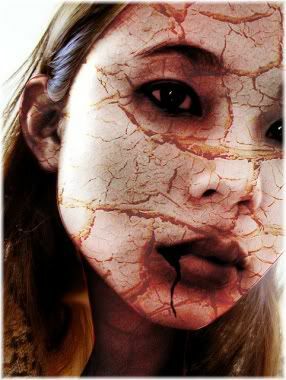 S0me scars are very difficult to conceal with makeup. Foundations can help to smooth out the edges of light scars and make them less noticeable, but for deep scars, foundations are not very effective at concealing them. If you are trying to conceal scars, you are likely to get better results by using a concealer or undergoing laser skin resurfacing if you have a very large and noticeable scar. Rosacea sufferers may find rose-tinted foundations beneficial in evening out their skin tone. If you have rosacea and/or broken capillaries which give your skin a reddish color to it, then using a green tinted primer with foundation can help to conceal this and give your face a more uniform color. 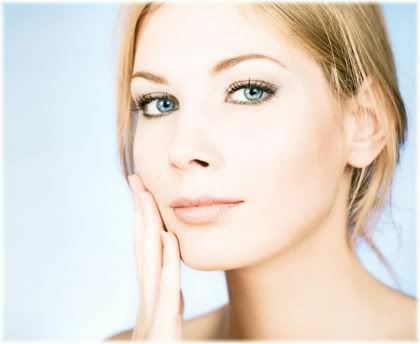 When your skin is smooth and uniform other products can be applied more easily and effectively. Once you have applied foundation to your face and evened out any irregularities, you will have a good base to work with to apply other cosmetics, such as blush and eye makeup. Using foundation before you apply such products will actually make them work better, as you will be able to put them on more evenly and smoothly. Sleeping with makeup on interferes with the natural cleansing of the skin at night. This increases your risk of premature aging. An important point to remember when using foundation and make up, is to always ensure that you properly cleanse and tone your skin before going to bed at night. Nighttime is when the skin naturally cleanses itself, so if you go to bed with a dirty face, then it won’t be able to do this properly and you could actually suffer from inflammation of the skin which then puts you at risk of premature aging. Carefully applied foundation can contour the face to give it a more shapely appearance. Typically, this is most often done with the nose, jaw line and upper neck area. Before you apply foundation to your face, you should carry out your regular skin care routine. This includes using a cleanser and toner (optional) to remove dirt, oil, sweat, bacteria and pollutants from the skin, followed by a light daytime moisturizer to hydrate your skin. The first step is to thoroughly cleanse your face. By carrying out these steps, you will ensure that you face is kept clean and that your foundation will be able to spread evenly over the face. 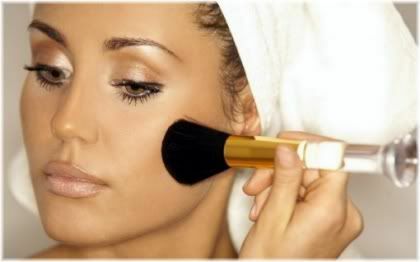 You will then be ready to apply your foundation using a sponge, brush, applicator or even your fingers! 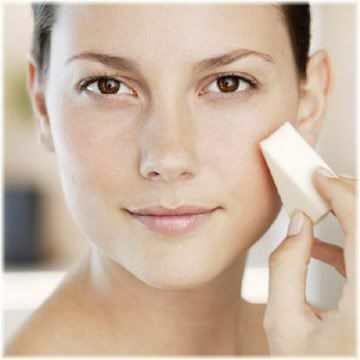 A sponge though, is probably the best foundation applicator, as it will allow you to get some color but not too much. A sponge will also allow you to blend in the foundation over your entire face. When using sponges, it’s also important to remember that most are designed to be disposable. So once they have been used up, they should then be discarded. To maximize the usage you get out of a sponge, use a different corner or area of the sponge each day and then throw it away when it has been completely used up. Sponges are meant to be disposable and so should be replaced roughly every three weeks. Most foundation sponges will last you about three weeks, but some you may be able to wash out and reuse for extended life. Be careful not to use your sponge for too long though, as otherwise you won’t be able to put on your foundation as well as you could be doing with a new sponge. 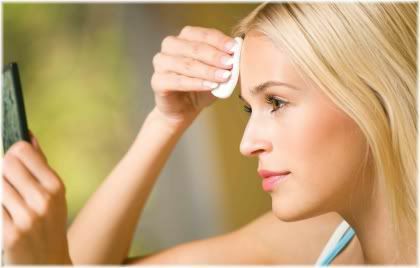 Start by dabbing a small amount of foundation in the center of your forehead, chin, nose and cheeks. Use your favorite applicator and concentrate on one area at a time. 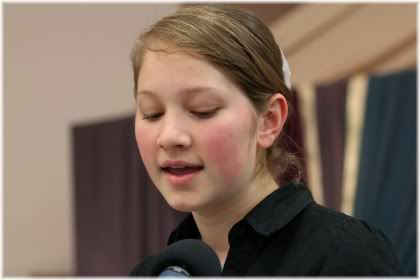 Once you have done this, spread the foundation outwards moving it towards the direction of the ears, temples and jaw. Repeat this for each area of your face, until your entire face has been covered. 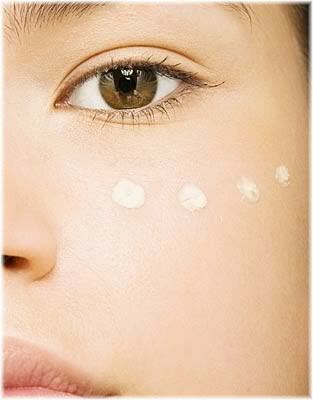 Place a dab of foundation in each major zone of the face and concentrate on one area at a time when spreading it out. 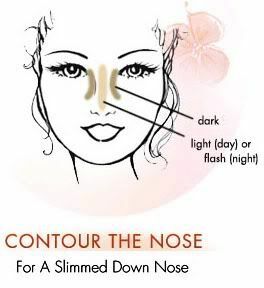 After you have applied foundation to the major areas of your face, check your nose, the inner corners of your eyes and the bridge of your nose to make sure that you haven’t missed any of these areas. Also, be careful when applying foundation to your hairline, as you don’t want to get any in your hair! Check to see that all areas of the face have been uniformly covered. Skin foundation should be applied to just above your jaw line, and then blended in lightly down your neck. If you have done this correctly, there should be no visible foundation line. If there is, then you have applied too much or are using the wrong shade for your skin tone. 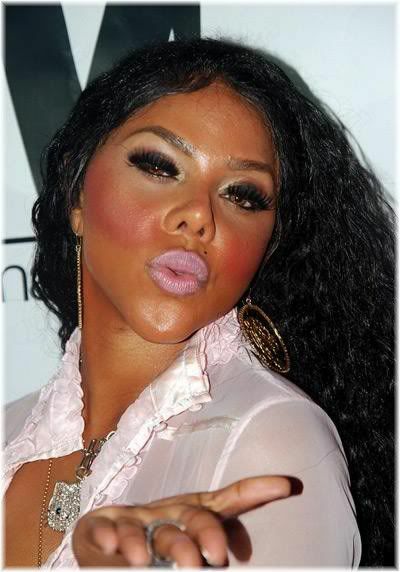 Be sure to blend in the foundation over your jaw line, as men find foundation lines very unattractive! Generally, you should avoid applying foundations to the lower neck region as they have a tendency to rub off onto your clothing. This can be especially embarrassing if you are wearing a white shirt! The more often you apply a foundation, the easier it will become and the better you will be at it. So when you are applying foundation for the first time, take it slow so that you can get a feel for how best to apply it to the different areas of the face. Don’t be too slow though, as otherwise it will dry out if you are using a liquid foundation. If you find that you are needing to apply more than the recommended dab, you may not be cleansing, toning and moisturizing your skin correctly. Remember, foundation should glide onto the skin easily when it has been properly prepared. The more you practice applying foundation the better your technique will become. 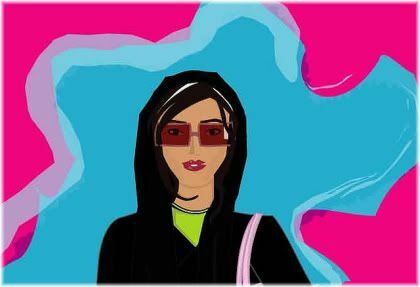 Once you have finished and covered your whole face, have a quick look to check that you have blended the jaw line and neck area correctly and that there are no visible streaks. If you do have foundation streaks, then try to smooth them out the best you can. If you are happy with the result, you can then apply some dusting powder to set your foundation if you choose. Otherwise, just go right ahead and apply your eye shadow, blush or lipstick as you normally would. Skin foundations can help to cover up fine lines and wrinkles, but they are not meant to cover up dark spots or blemishes. 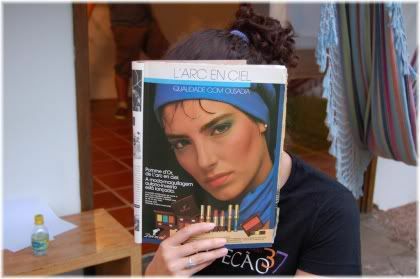 To do this, you need to use a concealer. Use a concealer that matches your skin tone as closely as possible. A concealer is a waxy skin care product which is designed to stay where you put it, and because it’s waxy, you should only apply a very small amount. 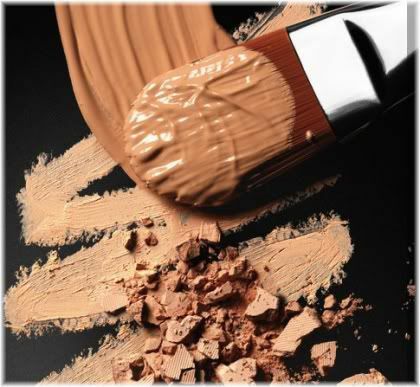 Concealers can be used either before or after you apply foundation, although most people prefer to use them before. Concealers can come in a light, medium or dark shade, so the color you use should match your skin tone as closely as possible. 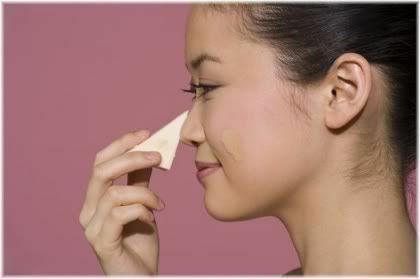 To apply concealer to your face, place a small amount on your sponge or brush applicator and then dab your skin gently. The idea is to create a series of small intersecting dots, rather than a large solid blob, as this will result in a more discrete concealment. A concealer should be applied in small dabs, and never with your fingers. You should never apply a concealer with your fingers because this will alter the formulation and make it less effective, more oily and less waxy which can cause it to migrate to other areas of your face. 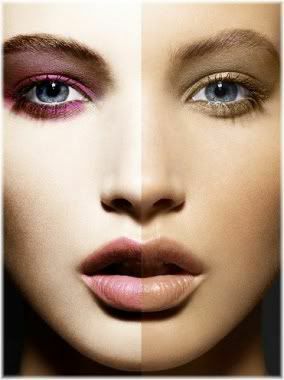 In order to get a foundation to blend into and complement your skin, you need to select one that matches your skin tone and color. For most women, this will involve a little trial and error, as you will likely have to try many different products before you find the right shade of foundation that enables you to achieve a natural look. It is important to remember though, that foundations are not meant to be used as a concealer. 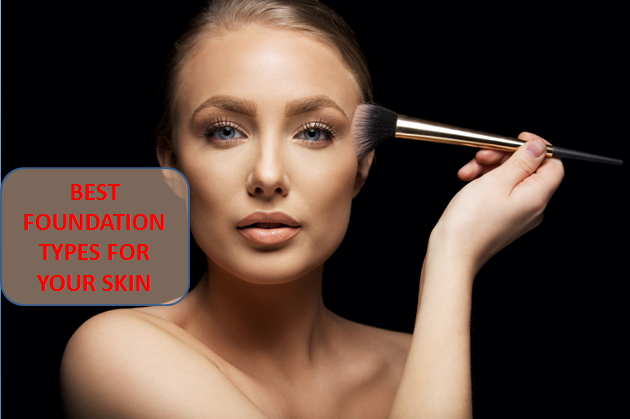 So even though you may be able to somewhat reduce the appearance of blemishes, pigmentation and other flaws, if you try to use your foundation primarily for this purpose, you are unlikely to ever achieve a natural look and it will appear very obvious that you have foundation on your face. Another point worth bearing in mind is that the type of foundation you use should also be suited to your skin type, which may be classed as either normal, oily, dry, sensitive, acne or combination. Today, women are quite fortunate, as there are now many different types of skin care products, such as cleaners, toners and moisturizers, that are specifically designed to work with different skin types. This means that whatever beauty or cosmetic product you use, you are likely to get the best results from using one that matches your skin type as closely as possible. If you go to the skincare, beauty or cosmetics section of your local department store, amongst all the different types of makeups you are likely to find a wide variety of foundations to choose from. 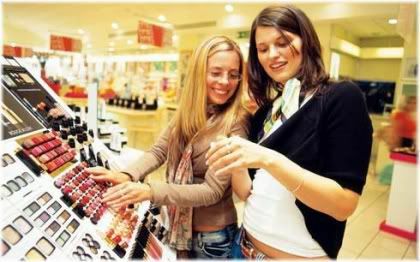 Due to the wide assortment of cosmetic products you are bound to find something that makes you look your best. This is great for you as a consumer, because having so much choice means that you are likely to find a product or brand which gives you the type of results you are looking for. Unfortunately, however, all this choice can also be very confusing! To help make your next trip to the cosmetics counter a little bit less confusing, below you will find listed some of the main types of skin foundations that you can buy and why you may or may not want to purchase them. A tinted foundation can help to give your skin some color, but it doesn’t work well with all skin tones. Tinted foundations include a touch of color, such as pink or apricot, to give a gentle lift to your face. These can be useful if you have a pale complexion and want to add some light color to your face. Although tinted foundations can work well for some people, such as those with rosacea, they don’t suit everyone and applying too much can give your face an unnatural looking appearance. Tinted moisturizers are basically liquid equivalents of tinted foundations. They are designed for people who like tinted foundations but find them too heavy to wear and want something lighter instead. Tinted moisturizers are like a liquid version of tinted foundations but don’t provide as strong of a coverage. Tinted moisturizers have a hint of color to them and are very light with a transparent finish, but are not designed to replace your existing moisturizer or face cream. The downside to using tinted moisturizers is that because they are so light they tend not to be that effective at concealing irregularities on the skin, and may cause some skin types, such as oily skin, to appear shiny or greasy. Note: You may sometimes see tinted moisturizers as being referred to as “sheer foundation” which means that it provides very little coverage. Liquid foundations are one of the most popular types of foundations currently available on the market. They are formulated for all skin types and so can be moisturizing for skins such as normal, sensitive or dry skin, or oil-free for skins such as oily or acne skin. Liquid foundations are now formulated to work with all skin types. Some women, however, find that even the oil free versions can still make their face look shiny. So whether or not a liquid foundation is likely to work well for you, really depends on how oily your skin is. 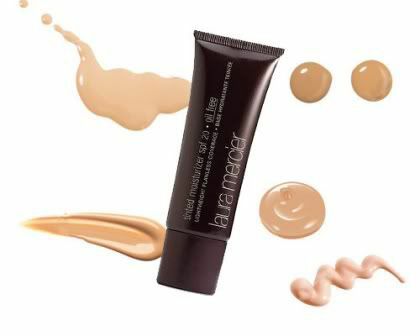 Liquid foundations generally provide sheer coverage. This makes them very light to wear and they won’t be cakey or clog your pores. This type of foundation is very easy to apply, and providing you select the right shade for your skin tone it can produce a very natural looking result. Liquid foundations can be applied with your fingers, a cosmetic sponge or a foundation brush. They can come in light, medium and heavy coverages, but tend not to be that effective at covering up dark blemishes or deep scars although they can work well for uneven skin tones. 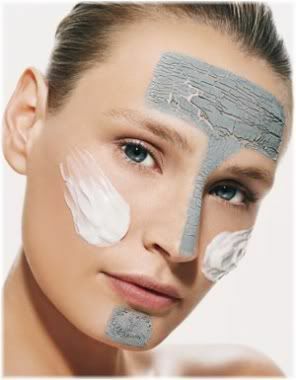 As the name suggests, what starts off as a cream eventually turns to a powder when it dries on your face. Being a cream means that you will be able to apply it easier, quicker and get more even coverage than you would do with a regular powder foundation. It starts off as a cream but quickly turns to powder. However, cream to powder foundations tend not to be suitable for oily skins as they can make the face appear overly oily. This type of foundation can provide you with a medium to heavy coverage, and so it can work quite well at concealing skin irregularities and discolorations. But if it is applied too heavily on the face, it will cause a caked, heavy look which makes it obvious that you are wearing makeup. 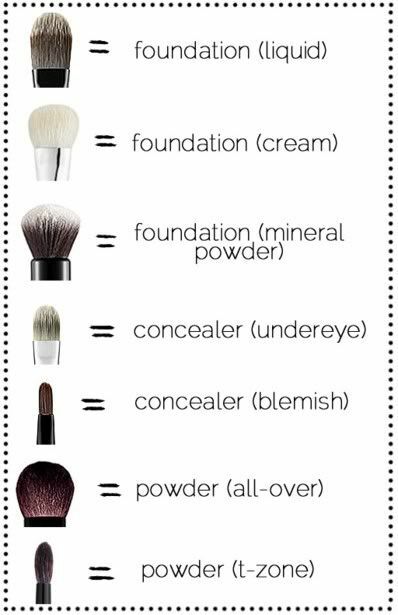 Cream to powder foundations can also be found as stick foundations. A stick foundation comes in a lipstick like container, which makes them very convenient to carry around with you and when you need a quick touch-up. Powder foundations usually come in a small portable holder. Because they are powder they won’t spill, which makes them ideal if you need a quick touch up during the day. Powder foundations are perhaps the most well-known type of foundation. They are quick and easy to apply, and can provide varying levels of coverage. The main advantages of using powder foundations is that they are very easy to apply, light to wear and the matte finish that they produce can be helpful for controlling shine or excess oil on the face. They are also quite long-lasting, although you will still usually require several touch-ups throughout the day. 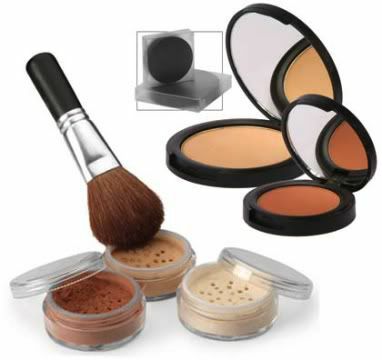 Because you can get light, medium and heavy coverages, powders can be used to conceal blemishes if built up enough. However, applying too much powder can result in a cakey look and so they tend not to work that well for this purpose or for concealing wrinkles or scars. Powders are also not very suitable for dry skin types, as they don’t sit very well on rough or flaky skin and can cause the skin become overly dry. Light diffusing foundations can be useful for concealing flaws due to the effects they have on light. A light diffusing foundation uses tiny light diffusing particles to camouflage pigmentation, fine lines and wrinkles by creating a satin finish. This has the effect of blurring out flaws and imperfections, which makes this type of foundation especially useful for older women as it will help to give their skin a glowing and youthful looking appearance. A light reflecting foundation reflects light off particles around your face. This can give your face a more radiant looking appearance, although it can also cause some faces to appear overly shiny if the foundation does not also use light diffusing particles. 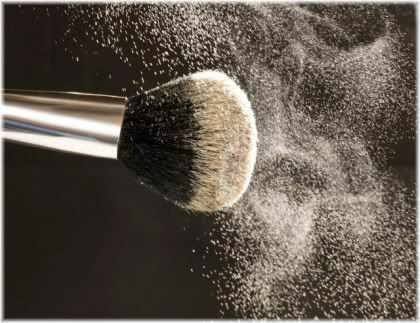 Mineral powders are applied to the face with a foundation brush. They are light diffusing and so they can help to conceal fine lines and wrinkles whilst also giving your face a youthful glowing appearance. Mineral foundations also function as an effective sunblock. Mineral foundations may also contain sunblock in the form of zinc or titanium oxide which can protect your skin from premature aging caused by too much sun exposure. 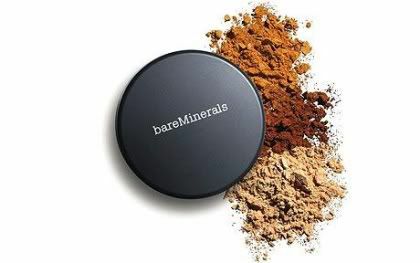 Another advantage of using a mineral foundation is that they usually contain very few ingredients and are hypoallergenic, which makes them especially suitable for those who have sensitive skin. The professionals get it sprayed on! 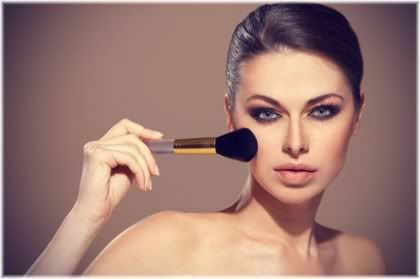 Airbrush or spray foundations are applied to the face using an airbrush. This type of foundation tends to be used by professional makeup artists as it results in a flawless finish, but it is a much more expensive way of applying foundation compared to the other more traditional methods. An alternative to spray foundation is mouse foundation which produces similar results and is also very light to wear. Choosing the right foundation can give you a big boost to your overall level of confidence and self-esteem by making you look more attractive. Choose something that is hydrating for your dry skin. For dry skin choose something that is hydrating and has an oil base. Avoid oil free foundations as these will likely be too drying and sit unevenly on the face. You are likely to get the best results by using a cream or liquid foundation, as powder foundations will be too drying for you. With oily skin you want something that’s going to soak up that excess oil, and if you have acne, you would probably benefit from a medicated foundation. If you have oily or acne skin, you want something that is oil-free and produces a matte finish. 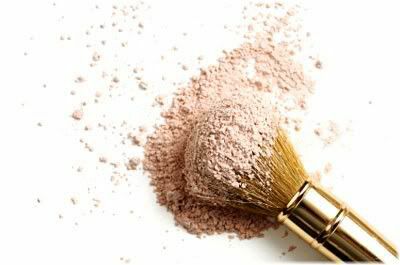 Powder or mineral foundations tend to work especially well for oily or acne skins, but may not provide enough coverage for concealing acne blemishes without the use of a concealer. Acne sufferers are likely to benefit the most from a foundation that is non comedogenic, so it doesn’t clog the pores, and contains salicylic acid to help control outbreaks. Due to your combination skin, you may benefit most from a cream to powder foundation. With combination skin you need to address dry and oily patches. Look for a product that offers shine reduction in addition to something that will lock in moisture where it is needed, such as a cream to powder foundation for example. Mineral foundations work well with sensitive skins. 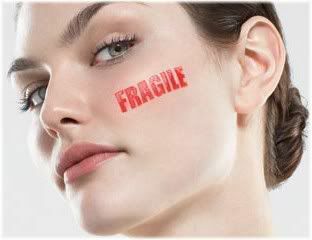 Sensitive skin can react badly if you use the wrong type of makeup or skin care product. Ideally, you want something that is fragrance-free, hypoallergenic and has as few ingredients in it as possible or uses all natural ingredients. Mineral foundations tend to work very well with sensitive skins. You’re skin will work well with anything! Count yourself lucky if you have normal skin because you can use just about anything and still get good results! This is of course, provided that you select the right shade of foundation to match the tone of your skin. Out of all the skin care products available, it is often said that foundation is one of the hardest to shop for. Not only do you need to select the right color for your skin, but you also need to select a foundation that works with your skin type. Getting the right foundation isn’t something that you are likely to do with the first foundation you buy, as it takes most people many months of experimentation before they finally find that perfect product. 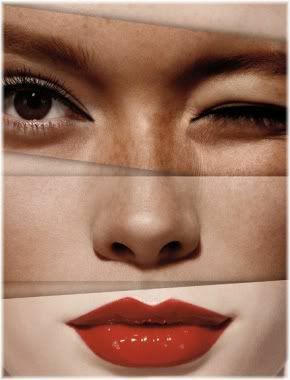 The perfect foundation is one that has a color which matches your skin tone. 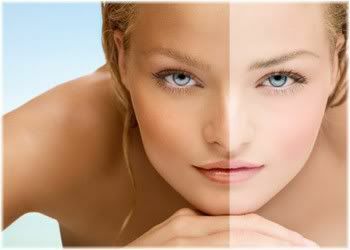 Generally, skin tones tend to have either a pinkish or a yellowish undertone. You may have to experiment with many different products before you find one that’s perfect for you. So if you have had a hard time matching your foundation to your skin tone in the past, then it is likely that you are using a pink undertone when you need a yellow undertone and vice versa. However, the best way to select the right foundation is by asking someone who specializes in this area, such as a sales consultant. They likely see many different faces throughout the day, and so should be able to give you good advice on selecting a product that will work with your skin type and tone. Ask the sales assistant if you’re unsure what to buy. Pay attention to how you look in both natural and artificial light. When you find a color which looks good on you indoors, it is always a good idea to see how it looks under different types of light. 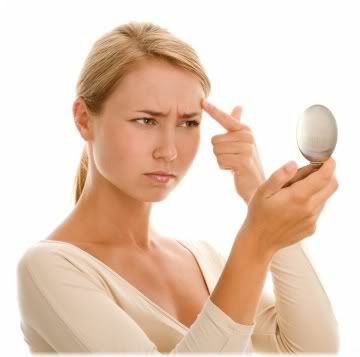 So take a mirror with you when you go shopping, and see how your skin looks under artificial light and in sunlight. An ideal foundation should look similar regardless of the light you are under. If you are testing a product in store, do so on an area that you can easily see and would normally apply the product to. 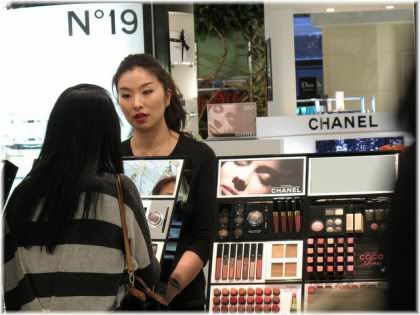 If you are testing a foundation in store, make sure that the sales rep puts it on the front of your cheek rather than on the sides or jaw where you can’t see it. Also, don’t test foundation on your hand or neck. Test it where you will be using it. It’s hard to make a decision on the spot, so why not request a few samples to take home? Before making a commitment to buy a product outright, it is a good idea to get a sample first so that you can test it out for a few days. Sometimes, you may react badly to a skin care product, and so this is something that you will be able to easily identify if you have a sample. Your foundation should look good on you both during the day and during the evening. You only need one foundation that you will use for both the day and evening, and you only need one color: the one that matches your skin. The only exception to this is if you want to use a lighter foundation during the winter and a heavier foundation during the summer. If you feel like crap you will think you look like crap! One of the worst times that you can go shopping for any skin care product is when you are in a bad mood because you will think that everything looks horrible on you. So go shopping in a good mood! Don’t buy brands. Buy what works. Just because you use brand “x” to cleanse, tone, and moisturize, it doesn’t necessarily mean that they are going to have the best foundation for your skin. Choose a brand that works well for you and not just because you are using it already or because your friends are using it. A bottle of foundation should last for around six months. A regular bottle of foundation should last you for around six months, so if you are buying foundation more often than this, then you are probably using too much. The only exception to this is if you have acne skin, in which case, you should replace your foundation roughly every three to four months to prevent it from becoming contaminated with acne bacteria. If you use fake then make sure you’re wearing it when shopping for foundation. If you use a tanning lotion on your face then make sure that you have it on before you shop for foundation, as otherwise you are likely to pick up the wrong product which won’t work with your skin type or tone. Be extra fussy if you have dark skin and don’t settle for something that looks just ok. 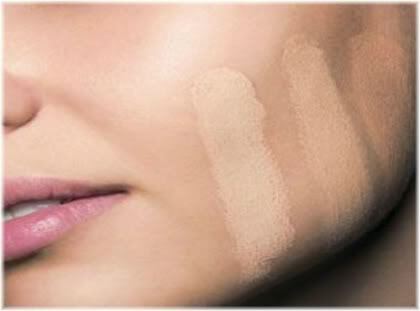 If you have dark skin, be very fussy about the foundation you choose and make sure that it suits your skin type well. Something which just looks ok is probably the wrong product for you, as you want something that looks as natural as possible.